After a week off from work (but still managing to put in a couple days at the office.....ugh) it was time to head to the monthly card show this morning. It's something I always look forward to - even if it's the same vendors and even if they have (mostly) the same stuff on their tables. It's a good chance to just relax, chat with other hobbyists and have fun for a couple hours. I managed to find a couple Lindens for the pc....nothing too extreme to warrant a blog post (especially after what I've got to show today) and a nice gift which I am sending off tomorrow to very generous collector. It was a quick trip today as I wanted to head down to an antique show I had heard about. I was hoping that a certain person would be setting up and that he would be bringing some stuff I've seen previously at shows. Sadly....he was not there this time. But that doesn't mean I can't still have some fun diggin' around. And boy did I ever find some gems. 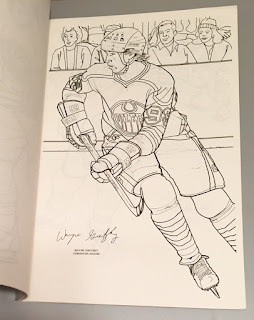 If you were a kid in the early 80's.....do you remember this colouring book? I certainly do. But I had all but erased it from my mind until I saw it sitting up against the back of a table. Everything stopped as I knew I needed to check it out. 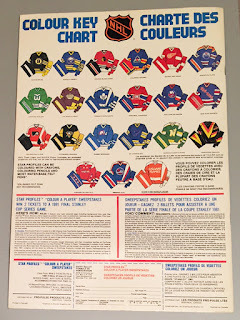 This was back when there were just 21 teams in the NHL.....a time period that I know better than probably any other. This book shot me back to that time period and what a trip. Ah yes, the colour key chart. How 'bout them Canucks 'eh? And I wonder if they would still accept entries to their contest? The pictures are fantastic.....and most are full page (this book is big...my guess is like 10x14 size). All are quite realistic....as in you can tell who they are without needing to check out their name. 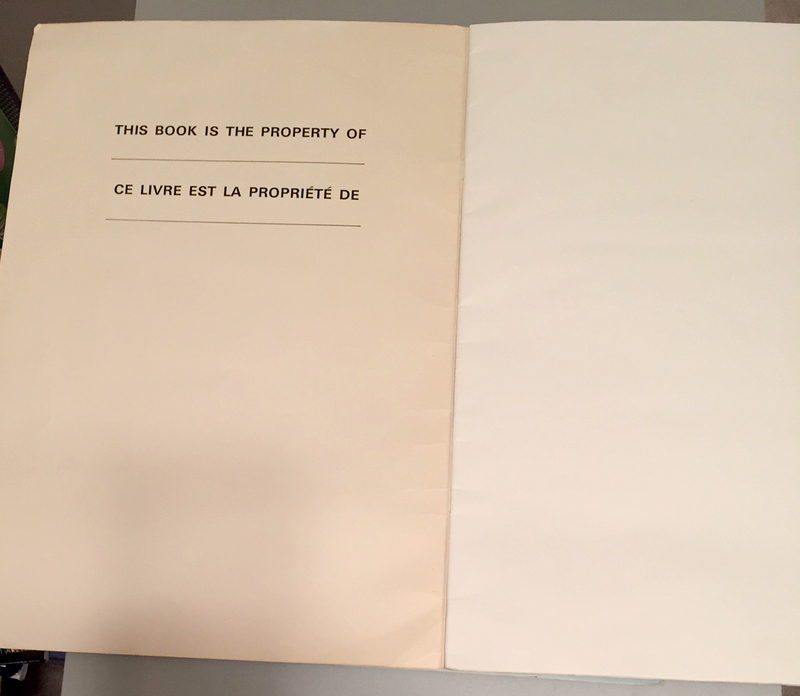 And yes, the book is completely clean. Not a single crayon or marker in sight. The Great One.....before he was really given the moniker. (note: just pointed out to me - check out the spelling....awesome) This book was released in 1980 I believe. Why do I say that? 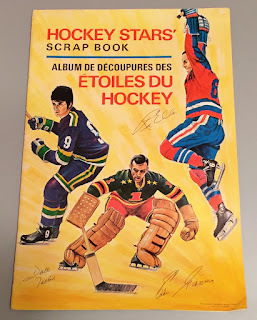 Well I'm from Calgary and I remember being a little ticked when I got the book. 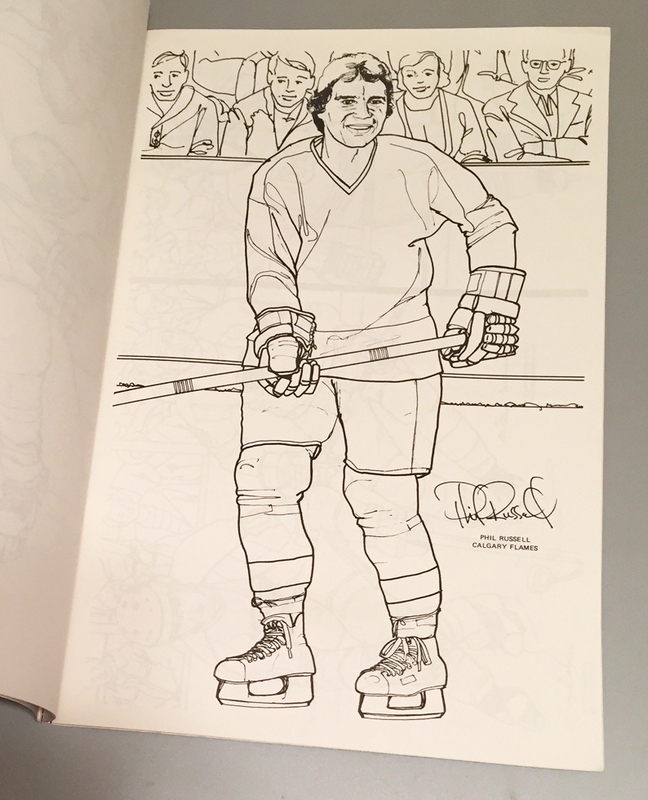 Phil Russell - sans logo. What the heck???!!!! My hometown team, not represented. Well, this book came out shortly after the Flames relocated from Atlanta. So soon after that a logo didn't even exist. Did you notice it on the front cover? That's a whole lotta awesome going on in that pic. I love the "suggested logo" idea. I on the other hand decided to draw my own "Flaming C" on Russell's jersey. And I think I did a good job at the time. More great pics from the book. 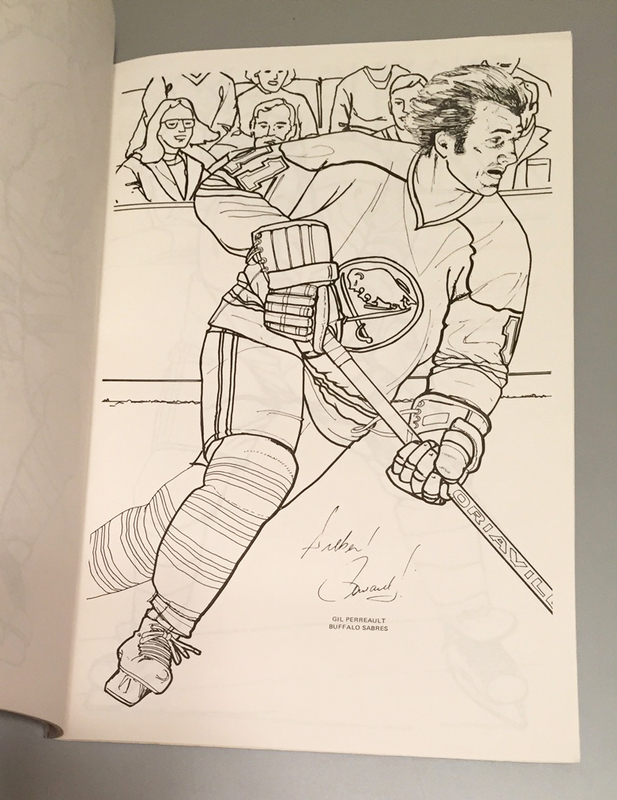 Lafleur minus the helmet is how I remember him the best. Makes me want to get the pencil crayons out right now. Poor Washington and Pittsburgh. They were so terrible that they had to share.....half a page. And they both would've been awesome full page shots too. Tony!!!! When I saw this photo I distinctly remember using this pic for a school project back in the day. I can even remember what I did. I cut this photo out (no photocopying back then for me) and traced the outline a few times on different sheets of coloured paper. I then cut out each one of those and made a little action kaleidoscope. I'm sure I got a killer mark. I wish I still had that project. Sweet. Tiger Williams. Cool jersey. I'm pretty sure this was the first one to get the colouring treatment. 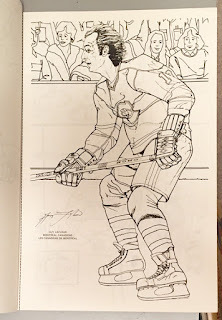 I just can't remember if I did the jersey in black or yellow. Either one would've been stellar I'm sure. 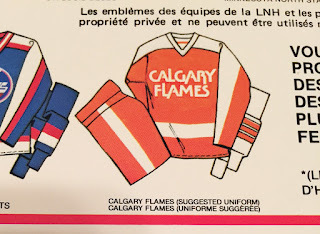 One last look at the "suggested logo" for the Flames. Yeah.....let's throw away that orange and get some red out. Can you imagine it though. Now, another great find - at the same table - had me doing a little bundling. Man alive this looks sweet. I don't remember having one of these as a kid. But that's ok because I have it now. Who had a scrapbook like this when they were young? I remember having a bland, scenic cover one with lame newsprint-type paper in it. This one would've made me super-popular. It's got Eddie Giacomin on the front!! What's interesting is that you can clearly see this product did not have the NHL's endorsement. No logos. 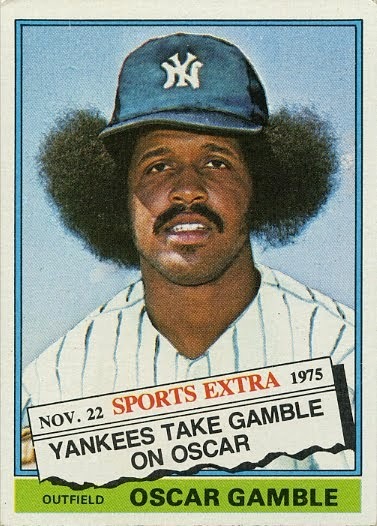 In fact, what the heck team is Ron Ellis even playing for? 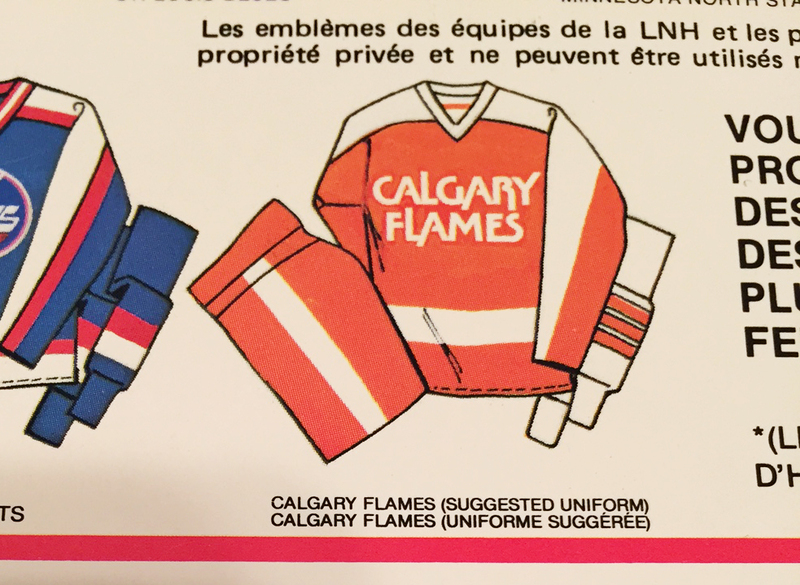 Looks like the Alberta Oilers of the WHA. Oooooooooooh.........I've got a Property Of. 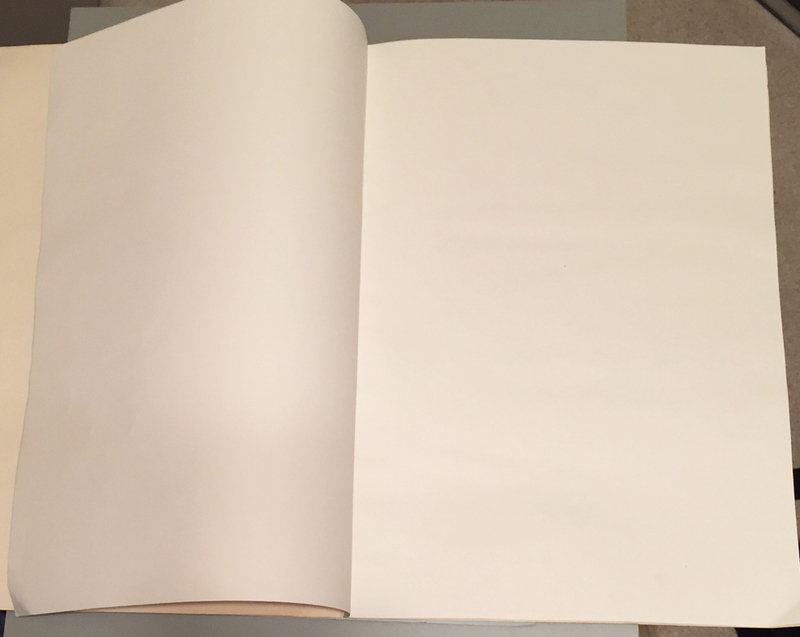 Why am I showing off blank pages? Because these blank pages speak so loud as to how awesome this scrapbook is. It's just screaming for stuff to be glued into it. 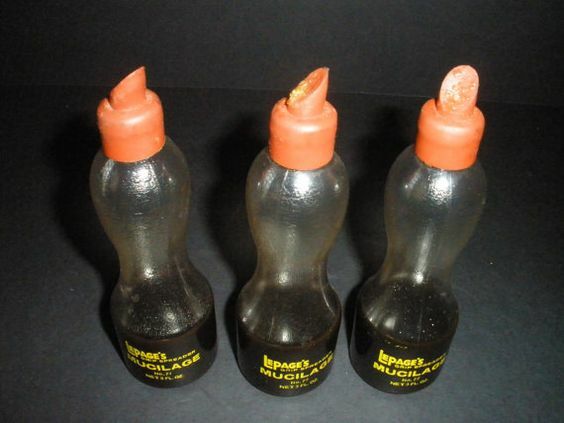 And not with an UHU stick....but with that old school glue I used all the time at school. Yeah....that's the ticket. Now we're cookin' with fire. Or should I say - Now we're gluin' with.........glue. I don't even know what to do with this book, but I just had to have it. So the two books......seven bucks.....for the pair. Ka-ching!! I couldn't get the cash out of my pocket fast enough. I went back to his table after bombing around the show and I'm so glad I did. Not one....but two Linden-era Medicine Hat Tigers pucks. Sure the one is a little "used" but I don't care. You just don't find stuff like this everyday. 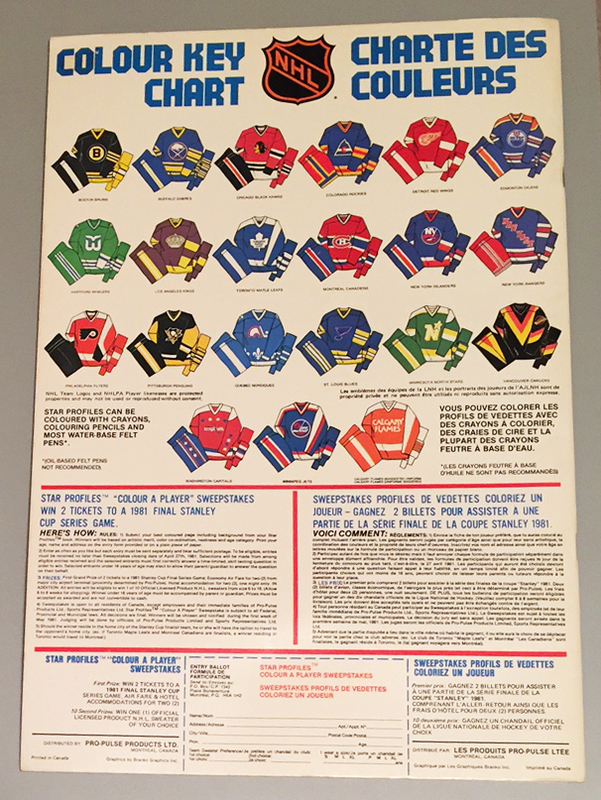 And the back of it has some great Memorial Cup memories. I think it says Memorial Cup Champions and then on the top cup it has 87 and the bottom one is 86. Frankly, when I saw "Memorial".....I was buying them. 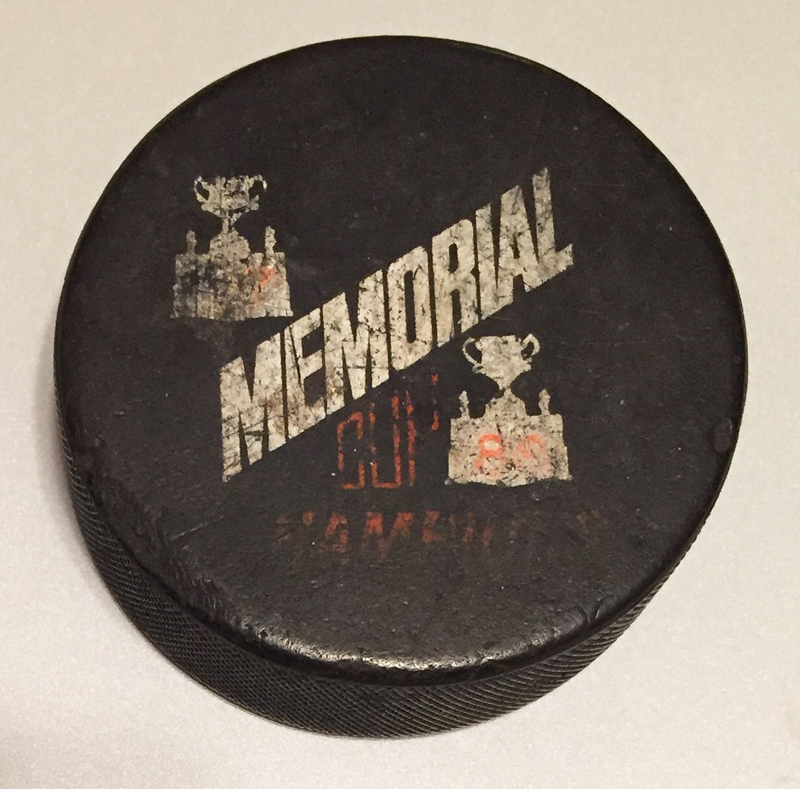 Seller said it was a game-used puck. Not sure about that....but it sure does look used. For the five bucks I paid for the pair....they'll make for great stories. And I'm going to try and get the other one signed by Linden one day. I think it would look outstanding with this signature on it. It's a nice, clean unused puck. 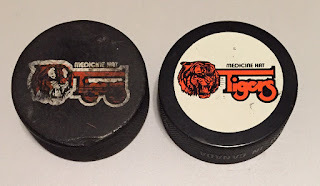 So good that I don't think the puck is 30 years old, but instead was a re-issue puck of some sort. Whew.......what a day. So much fun. 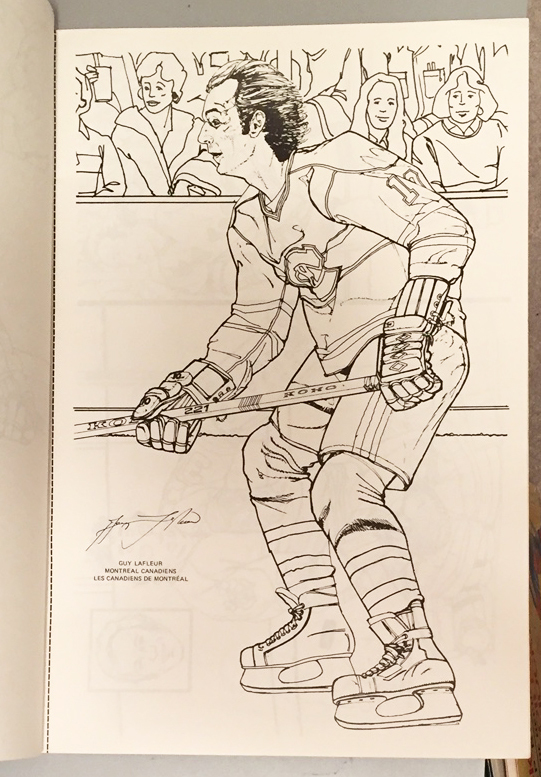 There are actually two different versions of the colouring book--one has the Calgary Flames logo in place of the suggested logo and no gold sticker on the front. Interesting. I did not know that. So it would kind of be like an error card and its corrected version. I hope mine is more rare. Very cool. 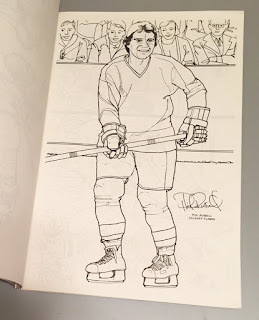 Does the Phil Russell in your book have a Flames logo on his jersey? If you scan the pages, you could color them multiple times over. Nice finds! This is true. But it doesn't fit the scanner (too big) so I'd have to do it in chunks and then piece it together in photoshop or something. 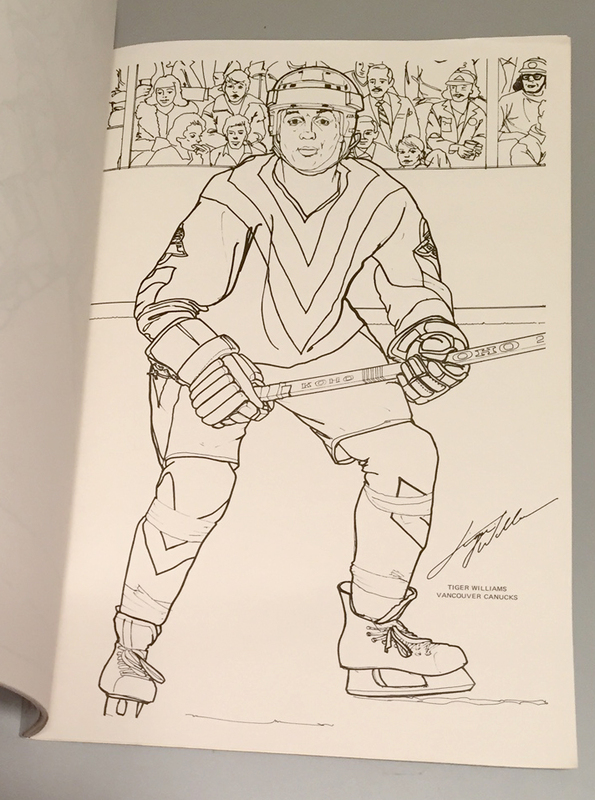 I'd never seen that coloring book, but that's a great piece! 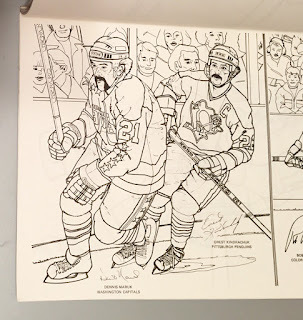 I was a huge Caps fan at the time so I could spot Dennis Maruk just from the awesome mustache. 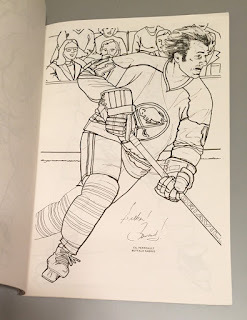 Too bad he had to share a page with Kindrachuk. 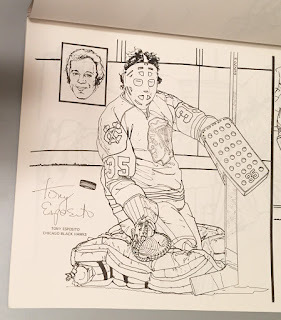 I love the little inset head shot so that fans could color in Tony Esposito's face. 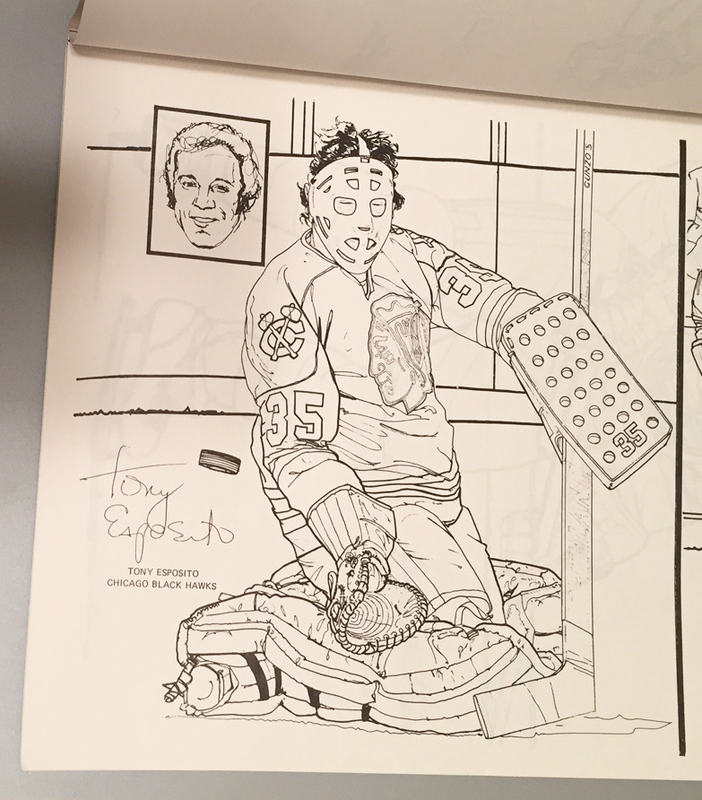 Now if I were that company at the time, I'd have done another book of just goalies. Could you imagine all the killer masks? Would have been awesome. 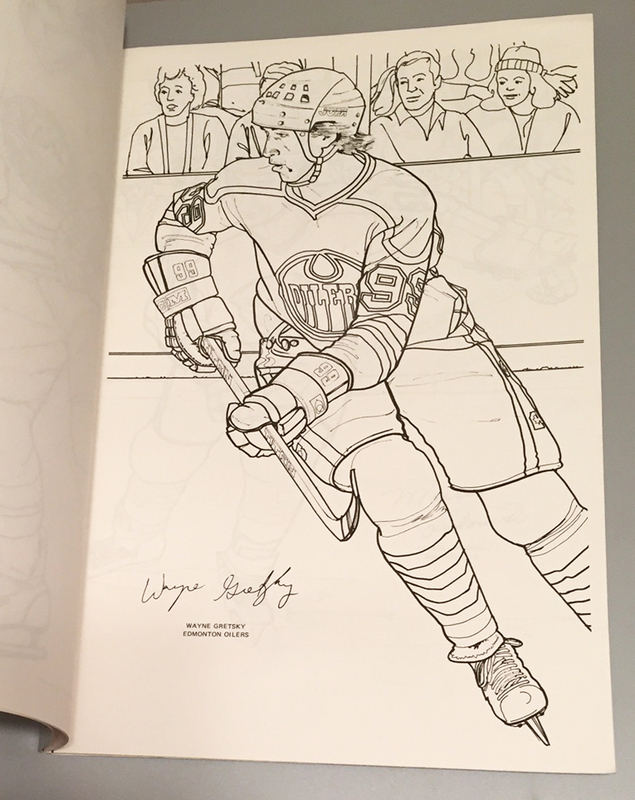 Sweet coloring book. The best part is seeing all of the players I've heard tons of stories about... but never got to see in person (ex. Tiger Williams). I have a coloring book from the mid 90's for my Owen Nolan collection. 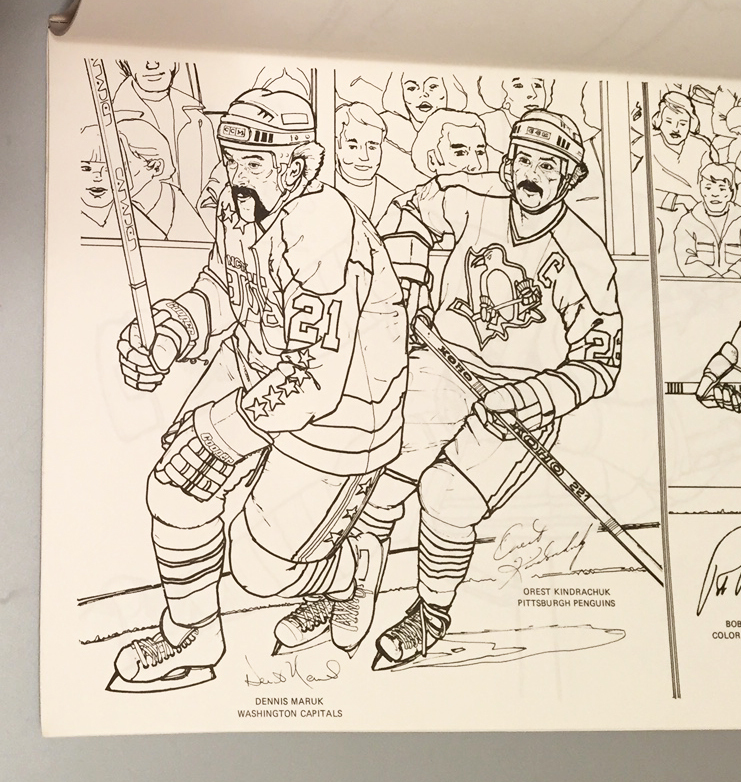 Might need to use Billy's idea and run copies... then have my students color them. 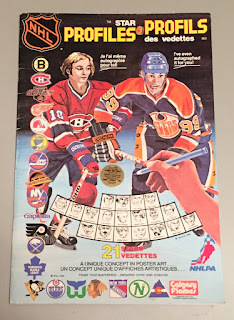 I remember that book when I was young and did you notice how they spelled "Gretsky", I mean Gretzky? I missed that one!!! Spectacular.